Strange Forest is the final Coin Hunter course in Mario Hoops 3-on-3. This course can only be played on during local multiplayer sessions. 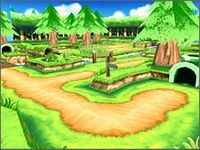 It is set in an isolated forest with a river running through the middle of the map. Strange Forest has no structural hazards, but it is intricately designed. There are fifteen ? Panels on the course at all times, each one in a random spot and not laid out in a specific pattern. There are many barriers that the players is not able to overcome, as they are forced to run around them. These barriers are many trees elevated on small platforms scattered throughout the entire map. There are bushes on the map that the player is able to run through. There is a river running through the middle, and it can only be cleared by using the two bridges. The first bridge is all the way on the left of the map, and the second is located more towards the middle. Like all other Coin Hunter courses, this map has two sets of connecting Warp Pipes. The first Warp Pipe is in the bottom left area of the map and transports the player to the top left area. The second set starts in the bottom right, and the players ends up in the top right area if they take the Warp Pipe. The winner of the mode is the player with the most coins after the 3:20 time limit is up. This page was last edited on May 30, 2018, at 22:18.